The Best Shot Foundation raises public awareness of the scope and destructiveness of global childhood diseases and builds political will to fund child survival. To raise awareness and build support for protecting vulnerable children, Best Shot spotlights pneumonia. The deadliest killer of young children, its lethality is hidden, even though it is easily preventable and curable. The Best Shot Foundation is working alongside leaders in this area, and we use complementary approaches to reach our shared goals. Although the Best Shot Foundation is organizationally young, it has gathered some important resources: its energetic board is headlined by ex-New Mexico governor Bill Richardson and its national spokesperson is football legend Steve Young; it receives advice and support from an extensive group of talented and generous individuals of varying backgrounds; and it has access to leaders in the Congressional, international health, and faith communities on which it will rely. Developed 182-member coalition (organizations representing 130 million Americans) to end violence and reduce suffering in Darfur. Recruited and guided talented team to educate and motivate the public and to influence policy. Represented the advocacy community in speeches and interviews with local, domestic, and international print, radio, and television. Raised more than $50 million from online, major donor, foundation, and direct mail sources. Planned, budgeted, managed, and reported on funds. Far exceeded financial expectations. Recruited and worked closely with celebrity advocates such as Don Cheadle, Joey Cheek, George Clooney, and Mia Farrow. Met with top government and political leaders, resulting in increased support for (or reduced opposition to) robust action to address atrocities in Darfur, including UN Secretary General Kofi Annan, President George W. Bush, Deputy Secretary Robert Zoellick, Egyptian Foreign Minister Ahmed Gheit, Arab League Secretary General Amr Moussa, and senior Chinese foreign ministry officials. Traveled to Chad to meet with Darfurian refugees and key players. Held together extremely diverse coalition from across religious, ethnic, and political divides. 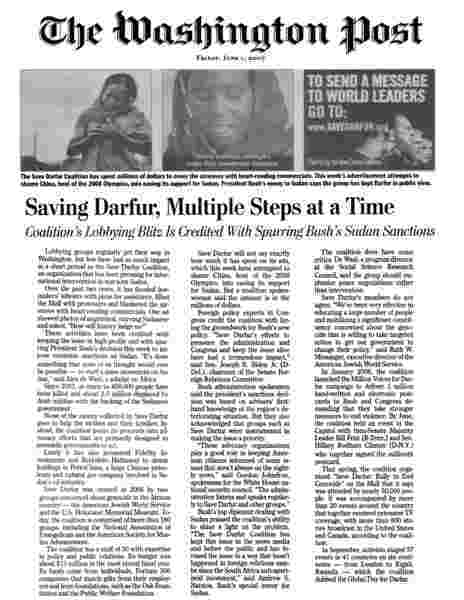 Helped to secure a UN Security Council resolution authorizing a civilian protection force for Darfur. Played a major role in increasing U.S. public awareness of the crisis from 14% to 59% (Greenberg Quinlan Rosner poll). Launched and supported an international advocacy movement. Stimulated and supported rallies and events in dozens of countries, including programs in highly repressive nations. Nurtured organizations whose efforts were fundamental in generating international pressure on the UN. Managed a wide-reaching and effective communications program generating news stories, editorials, and op-eds. Created educational and motivational documentaries. Built a powerful, useful, and effective website that was linked to by nearly 4,000 other sites. Developed unprecedented, massive, and powerful global advertising, paid-media and earned-media campaigns. Recruited more than one million online members. Designed and managed very large rallies on the national mall and in New York's Central Park, attracting 50,000 and 30,000 activists respectively; rallies garnered domestic and international attention and support and recruited tens of thousands of new supporters and several prominent speakers. Successfully advocated for passage of important federal and state legislation that applied political pressure and funded relief and peacekeeping work. Helped move China to engage more constructively with the government of Sudan and cooperate on a Darfur resolution within the UN Security Council. Built a national network of chapters, expanding effectiveness of advocacy. Sponsored and supported Governor Bill Richardson's peace mission to Khartoum. Held advocacy events with Sen. Barack Obama, Sen. Hillary Clinton, Sen. Joe Biden, Elie Wiesel, House Minority Leader Nancy Pelosi and Senate Majority Leader Bill Frist. Provided management and capacity-building counsel to 40 nonprofit executives and boards of directors. Worked with organizations devoted to child services, housing, legal services, environmental protection, and human and civil rights, with budgets ranging up to $18 million. Guided efforts in leadership recruitment and transition; strategic planning; fund raising; issues of board participation and direction; policy formation; technology enhancement; and personnel development and management. Designed and led staff and board meetings and retreats. Created and directed award-winning, five-city, community service and environmental education program. Served more than 800 teenagers and 700 mentors. Recruited, trained, and motivated large, diverse, and talented staff. Raised substantial financial resources from foundations, government agencies, individuals, and, corporations. Secured donated products and services. Managed effective operations with limited resources, keeping overhead below 10%. Developed and worked within budgets. Implemented computer technologies to reduce expenses and improve services. Attained financial stability. Attracted significant press attention for innovative plan and effectiveness, and received national awards for excellence. 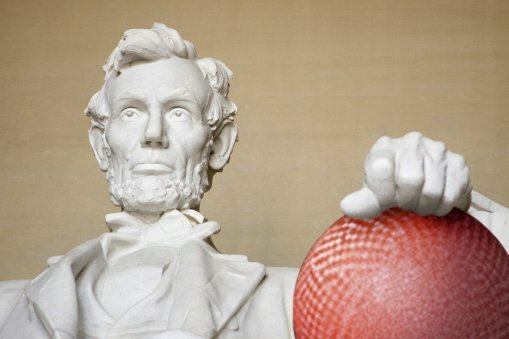 Built relationships and designed collaborations with partners, including schools; federal, state, and district agencies; corporations; non-profit agencies; and others such as IBM, AT&T, the Smithsonian Institution, and the National Park Service. Arranged organizational merger with Congressionally-chartered National Environmental Education and Training Foundation to insure best possible future for program's mission and foster its national expansion. Recruited and engaged nationally recognized board of directors, including Vice President Al Gore as Honorary Chair and football legend Joe Montana as Spokesman. Raised funds for nonprofit environmental certification organization. Devised and implemented plan to secure contributions from major donors. Helped produce annual fundraising plan, identified prospects, composed proposals, and met with foundation executives. Designed and implemented special development projects. Developed computer database to track donor history more effectively. Secured in-kind services. Represented Green Seal at public events and in press interviews. Managed work of consultants. Later served on board of directors. Managed MCI's largest commer­cial account, increasing sales by 200%. Built profitable relationships with client's subsid­iary companies. Developed and coordinated automat­ed order entry system, customized billing system, and specialized support program, resulting in MCI's highest revenue-to- expense ratio. Provided technical support for five major clients. Implemented ­first divisional Vnet (state-of-the-art networking service). Developed plans to improve response time and client satisfaction. Coordinated activities of 12 departments to develop, market, and launch MCI's flagship service. Developed effective training program and promotional materi­als. Managed technical relationships with several of MCI's highest visibility accounts. Coordinated installation of complex networks and MCI's first digital access line. Successfully sold MCI's service to commercial accounts, consistently exceeding quotas. Opened new sales territories. Helped develop and lead training seminar. "The Save Darfur Coalition has kept this issue in the news media and before the public and has focused the issue in a way that hasn't happened in foreign relations maybe since the South Africa anti-apartheid movement." - Andrew S. Natsios, President Bush's special envoy for Sudan. ''It is extraordinary. The fact that Darfur is even on the policy map along with Iraq, Afghanistan, Iran, North Korea, global warming, the fact that Darfur merits an 8 a.m. statement by the president, is testament to one thing and one thing alone, and that is this movement.'' - Samantha Power, Kennedy School of Government at Harvard University.